This simple side chair sits on a chrome plated breuer base that creates a contemporary feel in a dining space. 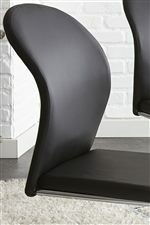 Upholstered in black faux leather, the seat back is curved and designed to form to your body. Moving the chair is easier as it will slide across the floor. The Tayside Black Breuer Side Chair by Steve Silver at Standard Furniture in the Birmingham, Huntsville, Hoover, Decatur, Alabaster, Bessemer, AL area. Product availability may vary. Contact us for the most current availability on this product. 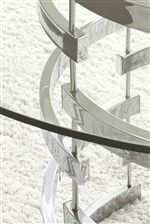 The Tayside collection is a great option if you are looking for Contemporary furniture in the Birmingham, Huntsville, Hoover, Decatur, Alabaster, Bessemer, AL area. Browse other items in the Tayside collection from Standard Furniture in the Birmingham, Huntsville, Hoover, Decatur, Alabaster, Bessemer, AL area.